Siberian Blue Quartz was created in Russia and is a cobalt blue laboratory grown Quartz. This stone has a hexagonal (triagonal) crystal structure and is chemically silicon dioxide. Silica is a mineral used in mineral makeup. 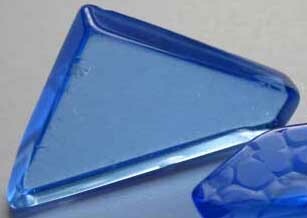 The cobalt in the crystal gives it the striking blue color. Colors have their own special healing meanings. Siberian Blue Quartz is a joint effort of man and nature. This stone has a flawless nature and does not have any impurities. This helps in a stabilized form of rotation in the molecules and aids in better transmission and circulation of energy in the crystal. Since it has Quartz in it, this stone is a great amplifier, carrier and helps in focusing all the energies of the quartz. This stone is a great combination of serenity, beauty and purity. It corresponds to the throat and brow chakra and helps in enhancing intuition, communication, clairvoyance, detachment and inner vision. This stone aids in cleansing the throat chakra. With the help of this stone a person can overcome the self limiting beliefs and enter the world of endless possibilities. It also aids in reducing tension and all kinds of stress and helps in detaching from the mundane matters and lower emotions in life. This stone helps in enhancing the flow of communication and helps a person to see the bigger picture and removes all kinds of stress and confusion resulting from the lack of knowledge. It’s a great healing stone, particularly for those people who are seeking solitude, quiet and peace. It helps the seeker to find enlightenment through higher knowledge and wisdom. It helps spiritually sensitive beings like Star Children to adjust and become comfortable on planet earth. This stone is quite programmable and can be used to enhance psychic abilities. It can also assist people psychically in looking for lost people or objects. Sleeping with this stone in such matters can bring forth enlightening dreams and visions which can help the person in his quest. This stone is great for people who work on mind or sight related pursuits. These include people involved in science, mathematics, public speaking, creative writing, teaching and acting. It also helps people who want to undergo past life regression or communicate with their spirit guides. Siberian Blue Quartz corresponds to the throat, third eye and crown chakras. It corresponds to the elements of wind and water.